The Athletic Trainer’s Society of New Jersey (ATSNJ) hosted a Fun Run with proceeds benefitting the Juvenile Diabetes Research Foundation (JDRF), in an effort to help Find a Curefor Type 1 diabetes (T1D). The event was held in honor of Aiden Prybicien, the son of ATSN Hall of Fame member Mike Prybicien. More than 80 runners representing athletic trainers, family members, local businesses and other organizations participated in the ATSNJ’s first fun run to benefit JDRF. 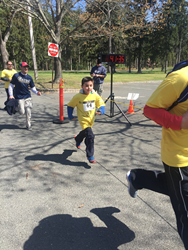 Participants ran the 5k course and the ATSNJ raised $2,000 which will be donated in equal portions to 3 different JDRF Chapters in northern, central and southern New Jersey. JDRF is the leading global organization funding type 1 diabetes (T1D) research. We exist for the millions of children, adults and families affected by this disease. T1D is an autoimmune disease that strikes children and adults suddenly. It has nothing to do with diet or lifestyle. You cannot prevent it—and there is currently no cure. If you have T1D, you must constantly monitor your blood–sugar level, rely on injected or infused insulin and carefully monitor your eating and activity—day and night. “JDRF has a special place in the heart of ATSNJ, because in February 2013 our past president Mike Prybicien’s son Aiden, 4 at the time, was diagnosed with Type 1 Diabetes.” said Eric Scwartz. he ATSNJ President. “ATSNJ vowed at that time to support Aiden, the Prybicien Family, and other student athletes diagnosed with diabetes." Now in second grade, Aiden is active playing basketball and baseball, but he still has to manage his diabetes daily. Since Aiden’s diagnosis, the family has learned just how complex diabetes can be. Throughout their journey, Prybicien family has received great support from friends and family–as well as their extended family in the athletic training profession. The ATSNJ established this event as a means to continue to make a difference and make this event extraordinary to help Aiden and all those living with Type 1 Diabetes. The run drew enthusiastic runners and support from sponsors who made the fun run an event which including not only the race by also fun activities and delicious food. The sponsors included: JAG Physical Therapy (Silver Sponsor) and Coe-Brooke Insurance Company and All Surface Asphalt Paving Inc., (Bronze Sponsors). DQ Events and Accurun Systems (Course mapping and timing logistics), Dunkin Donuts and Jersey Mike’s Subs (food donations). JDRF is the leading global organization funding type 1 diabetes (T1D) research. We exist for the millions of children, adults and families affected by this disease. Our strength lies in our exclusive focus and singular influence on the worldwide effort to stop T1D. The ATSNJ is dedicated to the advancement, and improvement of the Athletic Training profession in the state of New Jersey. The ATSNJ is continually striving to ensure that the student-athlete receives the best possible health care.